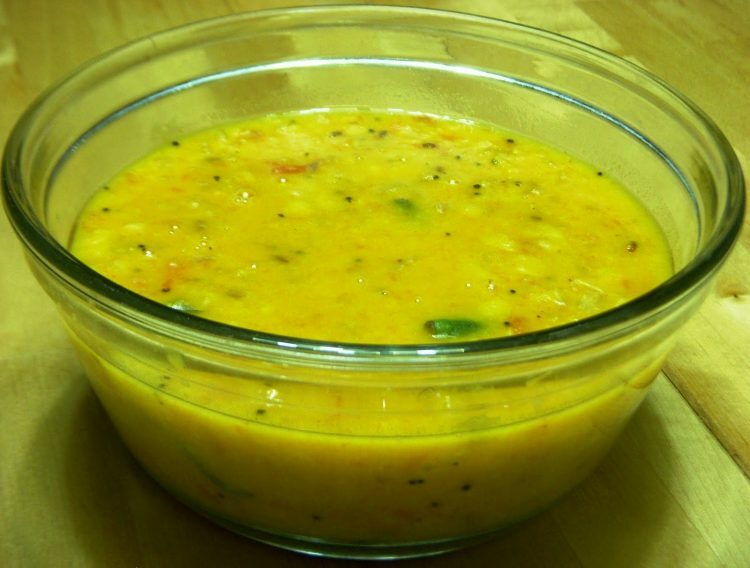 Cook the green gram dhal along with a pinch of turmeric powder till soft. Chop onion finely. Cut the tomatoes into medium size pieces and grind along with ginger to a fine puree. In a kadai put the oil and when it is hot add cinnamon stick, cloves and cardamom. Add chopped onion and fry till it is transparent. Add turmeric powder, chilli powder, coriander powder, salt and mix well. Add tomato puree, stir well and close with lid. Allow to boil. When it starts boiling, add the cooked dhal and stir well. Cook on low flame till everything blends well. Remove to another bowl. Slit the green chillies lengthwise and fry in a teaspoon oil along with curry leaves and pour over the dhal. Super……I tried your masala dhal and chow chow poriyal today..it was awesome…..thank you so much mummy for posting this authentic delicious and healthy recipes. May God Bless You. Thank you for visiting my blog snd your feed back. Hi madam, tried your delicious cornmeal kichadi. Turned out super duper. I used polanta. Thank you for your generous sharing. I tried this today.it came out excellent.I added some lime juice at the end to get tangy taste.